Not surprisingly, the second version of this battle began in much the same manner as the first; with another subtle Russian frontal attack on the main French position behind the parapet and redoubt! However this time only the second column was thus employed, while the third column worked its way along the banks of the canal that separated Nehrung Island from Holm Island in an attempt to outflank the French position. At the same time the first column moved to attack the outpost of the 2/2e légère and accompanying foot artillery that were deployed at the edge of the wood. So, as with the real battle, the period from 04:00 to 05:00 was spent with these manoeuvres by the Russian troops, under effective fire from the French batteries. Schramm sent the Garde de Paris to the left of his position to face off the mounting threat posed by the Russian third column. Help was on its way for the French, with the arrival of Gardanne’s “brigade”, comprising 1/12e légère, 2/Prince Anthony’s Saxon Regiment, 1 and 2/Prince Maximilian’s Saxon Fusiliers, in the rear of the main French position. 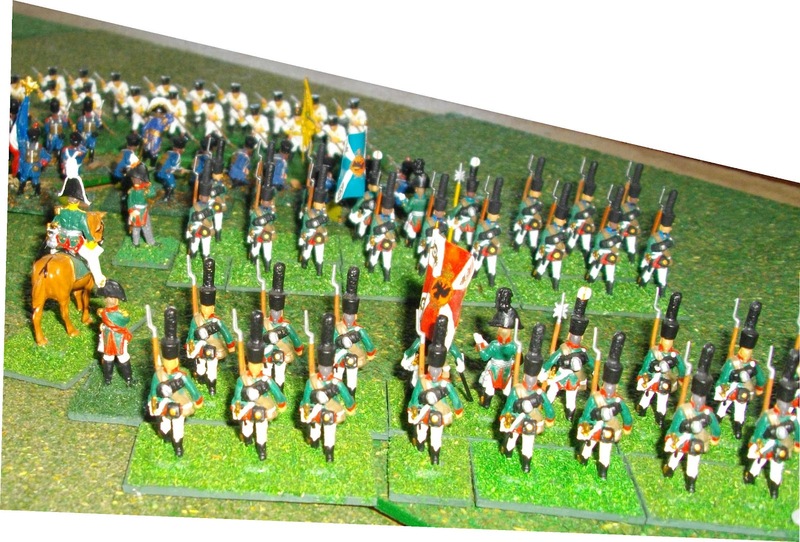 Would these troops be able to manoeuvre and deploy in time to stop the Russian third column? At 05:30 the two lead musketeer battalions of the Russian second column attacked the Saxon and Polish defenders behind the parapet. 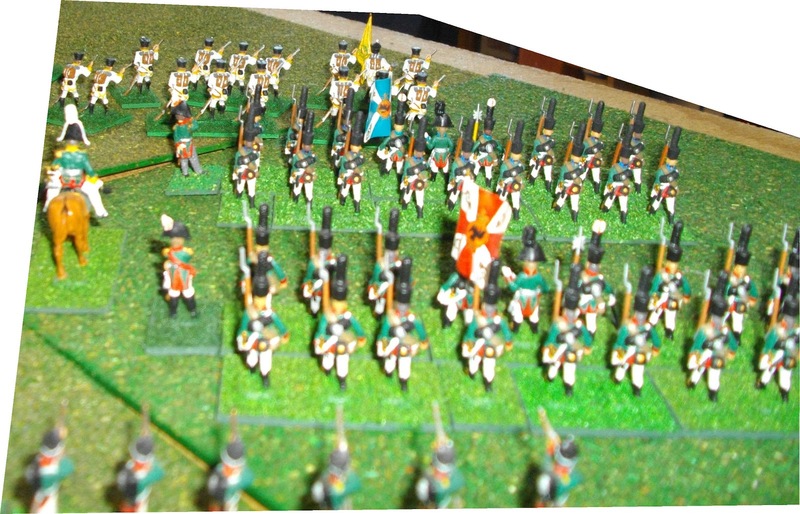 A well-aimed volley from the Saxon Grenadiers stopped the attack by one, while the other was beaten back by the 2nd Polish Infantry Regiment. Undeterred by this set-back, the determined Russians attacked once more. This second attack was similarly blunted. This time the fresh musketeers facing the Poles were broken by their stiff defence, losing their staff officer killed in the process. The musketeers facing the Saxon’s once again faltered in the face of the latter’s fire. At the same time, the third Russian column was beginning to turn the French left. An audacious charge by the 1st Regiment, Garde de Paris crashed into the lead musketeer battalion and sent them reeling back, broken, thus gaining time for Gardanne’s reinforcements to come into position in support. On the French right, things were going much better for the Russians. Threatened with being out-flanked by the Cossack’s of the first column, the 2/2e légère had refused to the right and the foot battery had left the cover of the redoubt and unlimbered facing the advancing infantry. It was thus situated, in front of the wood and in the open, that the battery was caught in flank by the Cossacks from the Russian fourth column that was approaching in support of the first and second. The gunners did not stand a chance and were ridden down or dispersed. It was now 06:30 and a time of crisis for the French-allied defenders. While the remaining battalions of the weakened Russian second column exchanged fire with the Saxon and Polish defenders behind the parapet, the third column was ready to attack in force. The lead battalion of grenadiers from this column charged and broke the newly arrived 1/12e légère of Gardanne's command. They followed this success with an attack on the 2/Prince Anthony’s Saxon Regiment, which was pushed back, but reformed in good order. These Russian successes were juxtaposed by the actions of the Garde de Paris which entered a firefight with another musketeer battalion from the third column, putting it to flight. Similarly, a third devastating volley from the Saxon Grenadiers was sufficient to cause the musketeer battalion of the second column, which had opposed it but had been reluctant to close in mélêe, to flee. This was a moment of truth for the remaining battalions of the second column. Urged on by their officers these dour troops continued with their attack on the seemingly impregnable position occupied by the Saxons and Poles (i.e. passed divisional morale). Reformed after their devastating charge on the French gunners, the Cossacks from fourth column combined with the lead musketeers from the first column to attack the square of the 2/2e légère. Isolated and thus attacked on two sides, the men of this battalion broke and fled through the woods. They would take no further part in this battle. It was now 07:30. The French right flank was exposed to the Russian first and fourth columns that were advancing slowly through the wood and across the plain respectively. Help was at hand for the French-allied defenders as Lannes and Oudinot arrived with four battalions of converged grenadiers. Would they be just in time to save the situation for their comrades? The remaining two French batteries fired for the second time at the jägers from the Russian fourth column, inflicting numerous casualties. At the same time, from their position behind the parapet, the Saxon Grenadiers unleashed another well-aimed volley and broke a third battalion of musketeers from second column. This was too much for the remaining battalion of the “brigade” which promptly followed their comrades. The second column had ceased to be a viable fighting force. This had become a side-show and the Russian grenadiers from third column continued their successful run of attacks, this time breaking the 2/Prince Anthony’s Saxon Regiment from Gardanne's brigade. Only two battalions of that formation remained, demoralised but still able to provide some support to the gallant men of the 1st regiment Garde de Paris. The Cossacks from the Russian first column debouched from the south-east side of the wood as Oudinot’s grenadiers deployed on the right rear of the French position. Seeing their opportunity for glory, the Cossacks charged the lead battalion of grenadiers. These élite troops calmly formed square and drove the Cossacks back the way they had come, broken. 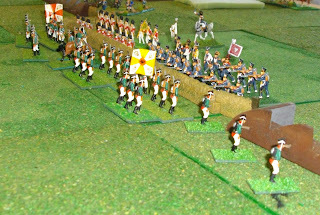 This was to be the last major action of the battle. Unable to manoeuvre to attack the remaining battalions of Gardanne’s troops, the Russian grenadiers exchanged fire with the Saxons in an ineffective firefight. Their musketeer comrades, hesitant to enter into a mélêe with the Garde de Paris, followed suit, again with little affect. Thus the last turn of the scenario ended with no units broken and no changes to the morale status of any of the “divisions”. The scenario was a draw, with each side scoring seven victory points. For us this version using Shako ANF was by far the more enjoyable game. 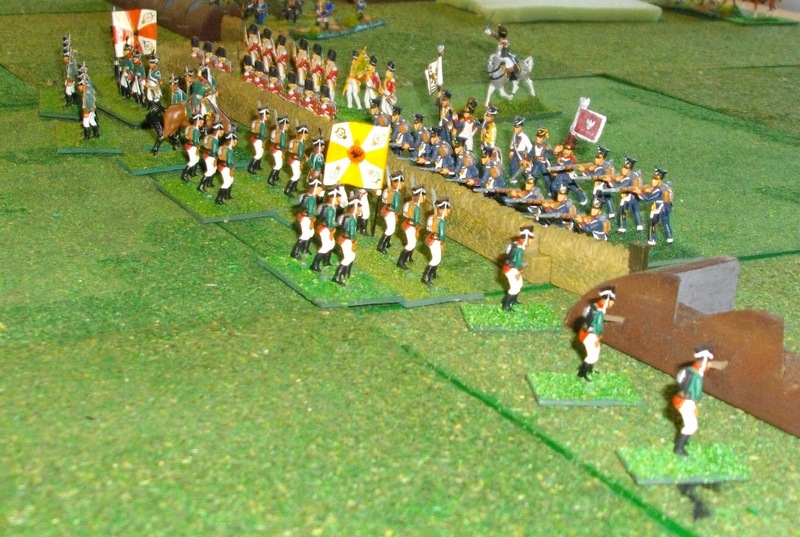 While both sets of rules produced similar, relatively historical outcomes, the game with Shako ANF was more fluid and allowed the players to focus on troop movements, tactics and combat options. While we are clearly more familiar with the Shako ANF rules, we do not consider this to be the reason for our conclusion, but rather the comparative mechanics of the two sets of rules. While we found the General de Brigade rules easy to learn, logical and easy to use, the number of tests for each combat were, to us, unnecessary and tedious and broke the flow of the game. Great batrep, James. Great to see a whole bunch of 1/72nd figures, too! Thanks Rosbif. I should have the report for Eylau finished soon, so you'll see heaps more there!